Students want to see themselves in jobs. Industry and agency engagement supports retention and success. This is proven over and over again. The College of Natural Resources Excellence Fund provides students the means to participate beyond the classroom, as they make connections with industry and agency leaders through professional organizations. Nowhere was this more true than in 2014 when the International Union of Forestry Research Organizations held its World Congress in Salt Lake City, Utah. Kurt Pregitzer, dean of the College of Natural Resources, used the Excellence Fund to help send more than a dozen undergraduates, including a contingency of Brazilian exchange students, to the conference, which had not been held in the U.S. for more than 35 years. The college was also well represented by graduate students and faculty. The U of I students hosted their peers at a pizza party to engage potential transfer and graduate students as well as build relationships with others going into the same industry. 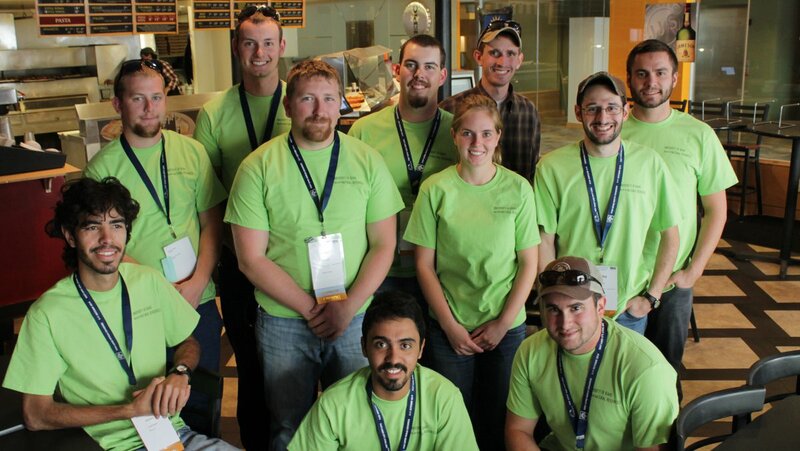 Students from the College of Natural Resources on a trip to Salt Lake City to participate in the IUFRO World Congress. “I am amazed with the capacity of impact that U of I showed during the exposition.” said Natan Barbosa, a U of I undergraduate from Brazil. The students participated in poster presentations and staffed the U of I recruitment booth. They saw their faculty and alumni prove the value of a U of I education as Anthony S. Davis, assistant professor, spoke, along with alumni Kas Dumroese and Jeremy Pinto, about joint research between the U of I and the U.S. Forest Service Rocky Mountain Research Station. The TED-style talks were held in the U.S. pavilion in the center of the Expo hall. The event is just one example of how the College of Natural Resources, with the help of its alumni and friends, prepares its students for success. Enter "College of Natural Resources Excellence Fund" as the designation for your gift.